The Washington County Sheriff’s Office has obtained charges against a Hagerstown man for burglary and theft. On September 12, 2017, at approximately 5:14 PM, the Sheriff’s Office responded to an address in the 400 block of Bethlehem Court, Hagerstown, for a reported theft. The victim advised her residence had been entered and nine (9), 4 week old Pitt-bull puppies had been stolen. The victim was concerned for the welfare of the puppies due to still being reliant on the mother dog for milk. It is at least another 4 weeks before the puppies can be without the mother dog. After the initial investigation, it was determined that Dawan Naquita Frazier, 24, had entered the victim’s residence and stolen the puppies. Witnesses confirmed Frazier was in the Frederick, Maryland area trying to sell the puppies. One of the puppies has been returned to the owner. Anyone who has purchased a puppy from Frazier is asked to contact Deputy Hetrick at 240-313-2100. Frazier currently has an active arrest warrant for 1st Degree Burglary, 3rd Degree Burglary, 4th Degree burglary and Theft. 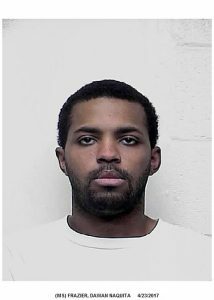 Frazier is known to travel in the Hagerstown and Frederick areas. Anyone with information on Frazier’s location is asked to contact the Washington County Sheriff’s Office at 240-313-2100.